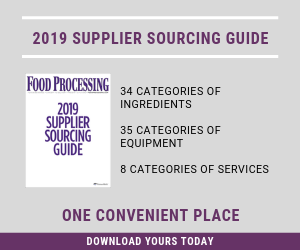 Mixing and blending are fundamental to many food processes, and matching the machine to the application is the first step in ensuring consistent results and quality outcomes. The ideal mixing or blending machine may well exist for your food product; the challenge is identifying which one is perfect for your specific application. The advent of the high-shear pump obliterated the line between mixing and pumping; it also scrambled the meaning of shear. No matter: There are so many other factors in liquid/powder, liquid/liquid and liquid/air blending that no single mixer could possibly satisfy all the general requirements, let alone the specific needs of a manufacturer. One attribute that all processors expect, however, is a cleanable, sanitary machine. Marine propellers continue to be used by some firms, but that method's days are numbered. While they wouldn't pass a rigorous food safety audit, marine propellers do meet many processing requirements. Silverson Machines Inc. sought to meet this need with a sanitary unit seven years ago when it introduced Ultramix, an in-tank mixer that delivers a degree of high shear without turning solids into purees. "We found there was a gap in the market," explains Matt Smith, sales director at U.K.-based Silverson, with U.S. operations based in East Longmeadow, Mass. "At the bottom you have a marine propeller agitator, and at the top is our high-shear mixer. With Ultramix, we came in the middle." Smith would get an argument from other suppliers about the top end's gold standard, but his point about the middle market is valid. Heat-and-eat meals are very popular in Western Europe and a growing category in North America, and consumers expect fresh ingredients that resemble their original form more than they do strained baby food. "You don't want to put too much energy in and change the rheology of the product," points out Smith. A propeller will satisfy that requirement, but its nooks and crannies would make a microbiologist cringe. Advanced controls are game-changers in liquid processing, notes TechniBlend's Derek Deubel, though they do require technical support, either from on-site personnel or remote support via personal devices such as I-pads and smart phones. Silverson preempts the harborage issue by machining the head of the Ultramix from a "solid billet of stainless steel," he explains. No welds, sanitary or otherwise, are involved, and a compressed O-ring isolates the threads on the shaft, preventing any contact with the product. The unit can be characterized as a mobile rotor/stator mixer, a class of machines that provides maximum flexibility for small-batch blending. Manufacturers typically mount the unit on a movable stand and insert the shaft into the vessel of their choosing. Tote bins containing up to 1,800 gallons and other difficult geometries can be thoroughly blended and mixed. Another portable solution is the Conti-TDS, which also works on the rotor/stator principle and excels in wetting and dispersing fast-swelling powders into liquids. Positioned outside a process tank, the unit draws in the solid and liquid from opposite sides into the dispersion zone, pulling the powder in under vacuum and effectively blending it before agglomerations such as fish eyes can form. Blending of gums is a common application, according to Rick Isherwood, president of Powder Technologies Inc., Hainesport, N.J., the technology's North American distributor. "Gums are one of the most challenging of the fast-swelling products but one of the easiest for us," Isherwood maintains. His mixer can handle a wide range of viscosities, from low viscous up to 250,000 centipoise. PTI's Ystral unit recently received 3-A certification and can be used in CIP processes. Developed in Germany, Conti-TDS (shorthand for transport and dispersing system) received U.S. patent protection in 1996. "A lot of copycats have tried to duplicate it, but the patents are so strong, they have been unable," says Isherwood. Leading processors of carbonated beverages began the transition from static mixers and multiple tanks for blending more than 20 years ago, and mid-sized manufacturers of all types of beverages are beginning to follow. High ingredient costs and multiple changeovers daily are key drivers, but human psychology also plays a role: Scrapping a process that works requires a leap of faith in newer technology. After decades of tire kicking, food company managers are beginning to make a change. Among the firms helping them with the transition is TechniBlend Inc. in Waukesha, Wis. Heavily populated by process engineers and KHS alumni, TechniBlend integrates Coriolis mass flow meters, instrumentation and components from multiple vendors with its TB-200 blender, an in-line unit that precisely mixes two ingredients before passing the fluid on to the next blender, until the formula is satisfied. The system is a variation of process analytic technology (PAT), the approach favored by FDA for pharmaceutical manufacturing. PAT uses real-time feedback from sensors to ensure that out-of-spec product is not released to downstream value-added processes, thereby improving finished goods outcomes and slashing in-process waste. For all the 3-A certified components and stainless steel sensors, the real star of the blending system is the controls architecture, suggests Derek Deubel, TechniBlend vice president. "Static mixers are great, but they are designed specifically for the ingredients you use and the flow rate you set to the mixer," he says. In reality, flow rates accelerate and slow down, forcing a system to cycle on and off and resulting in premature wear for pumps and valves and increased energy consumption. "We use variable speed mixing and stay in tighter process control," he says. Two check valves open and close, depending on flow, and ensure the two streams are deflected at a 90-degree angle for optimal mixing. The spirits business exemplifies the shift to in-line mixing. Instead of traditional distilling, companies bring in raw alcohol and create a base, then blend flavors and fragrances to produce ready-to-drink cocktails, cordials and other beverages. The change has unfolded in recent years. When Diageo completed a major expansion of its Plainfield, Ill., facility in 2009, two gin mills from the 1960s still were fired occasionally. Those mills were rendered obsolete and sold off, and the facility now is a blending and bottling operation only. TechniBlend helped Jim Beam make the blending transition in 2009, when the spirits company shuttered a Cincinnati distillery and shifted production to Frankfort, Ky. Deubel's firm engineered an 11-stream blending system for cordials, obsolescing the old process in which an individual would dump each ingredient in turn into a blending vat. "Instead of tankfuls of bad product, we put instrumentation as far up in the process as possible to measure product quality 3 feet after blending at 160 gallons a minute," Deubel recalls. Flavor oils replaced some dry ingredients, and the order in which tartaric and citric acids were introduced was shuffled, depending on how well they dissolved in a given chemistry. When it was time to throw the switch on the new process, senior managers traveled to Kentucky to bear witness. The trepidation was palpable, Deubel recalls. "They asked, 'What if it doesn't taste the same? We're concerned that the process is art, not science.' We said, 'Well, then you change it until it tastes right.'" That's not an answer the process industry is eager to hear, but it highlights the need to consider factors beyond mechanical motion. Silverson's Smith relates an experience early this year involving a Dutch manufacturer of ready-made refrigerated pancakes. The firm trialed the Silverson mixer in a 230-gal. vessel, improving yield and resolving nozzle-clogging issues the manufacturer experienced with a bottom-entry mixer. However, small lumps remained in the mix. Drawing on experience with a similar process, Silverson technicians recommended reshuffling the order in which ingredients were added. By dispersing flour and buckwheat flour first, they prevented the fat in milk powder from encapsulating those solids, resulting in a lump-free batter. "Mixing isn't rocket science: it's a spinning rotor inside a stream," concludes Smith. "Application knowledge also is important." So, too, is the particular mixer for the work at hand. SPX's APV Flex-Mix series for dairy numbers no fewer than seven different machines. "The technology ranges from simple static and venturi mixers to innovative vacuum mixing," according to Bent Oestergaard, director-global marketing, food and beverage for SPX Flow Technology, Charlotte, N.C. Depending on whether the application involves mixing liquid and air, liquid and liquid, liquid and particles or liquid and powder, a different machine is recommended for best results, not only in the blend but also in downstream homogenizers and other equipment. Mixing and blending are fundamental to many processed foods. Far from being commodities, the particular machine selected for the job and the way it is used has a profound impact on a food manufacturer's finished goods.